This detective will share all her findings on products that promise to make you glam! Hello! It's been a hot minute since my last post, and I apologize because life got the better of me. Now that school is out for the winter holidays, I'm ready to get back into blogging! 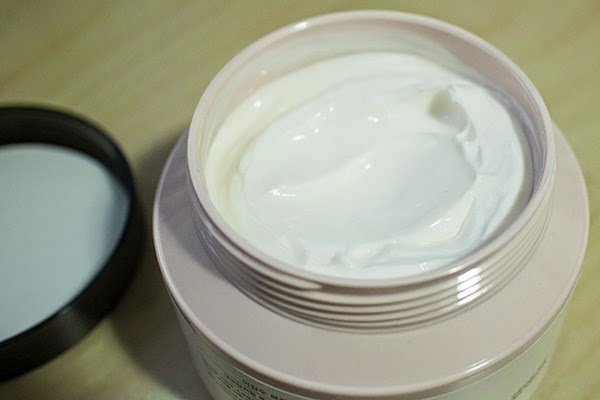 My first review is going to be on another Face Shop product, because I recently had to replace some of my favourites and change up my routine for the winter. However, The Face Shop is quite popular in the GTA since many products sell out. Luckily, they do have alternatives for each type of skincare product and the associates are always very helpful. Without further ado, let's get into the review! I bought this from The Face Shop for $15 CAD. This big container comes with 400 ml of product. There was also a container with 200 ml of product for $10. (Obviously, I went for the better value.) 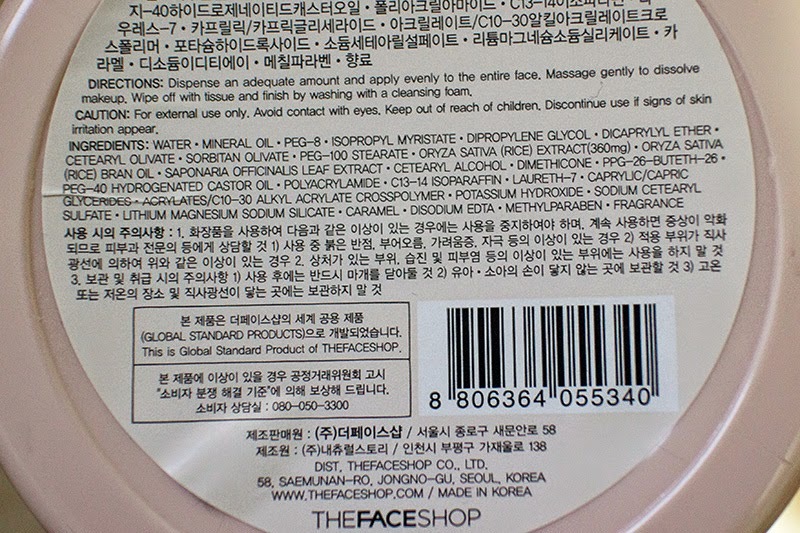 Alternatively, you can also purchase The Face Shop from online stores that sell Korean products. You can check out this blog post to see my favourite online shops! This product comes in a simple plastic tub. 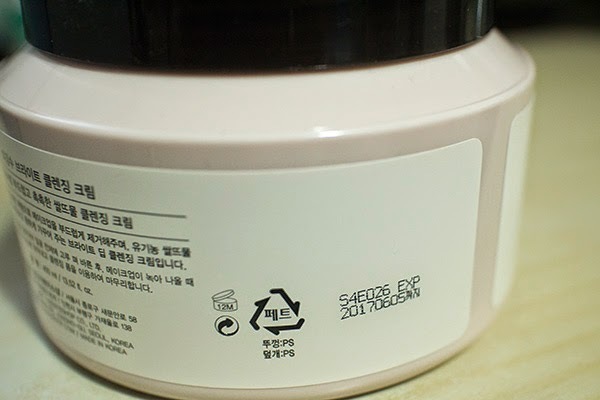 While not the most sanitary container, it's suitable for a cream product such as this. To keep from contaminating the cream, just use a fresh q-tip or spatula every time you use this. I also appreciate that the expiry date is clearly printed on the tub. This looks like any other face cream. Honestly, it kinda reminds me of the Nivea cream my mom uses. It has the same kind of thickness, but once you rub it into your skin it melts and feels more like a cleansing oil. This is similar to the Cleansing Oil Balm also from The Face Shop that I reviewed previously. I actually got this to replace that oil balm since it's frequently sold out in stores! The difference between the two is in the starting consistency, as the oil balm is balm-y and this is clearly a thick cream. Also, the oil balm can remove makeup faster. The second ingredient in mineral oil. However, I haven't noticed any adverse effects from this product. Also, this cleansing cream is only on your face for a couple minutes at most before you wash it off. The directions also tell you to follow up with a cleansing foam (aka foaming cleanser). I haven't had any reactions to this, but if you know you have sensitivities to mineral oil, then steer clear. I've also done some research on mineral oil, but I highly encourage you to do your own research to be a more informed consumer. This article on Paula's Choice gives some good insight. The best way to show you how effective this cleansing cream is is to let you see it in action. 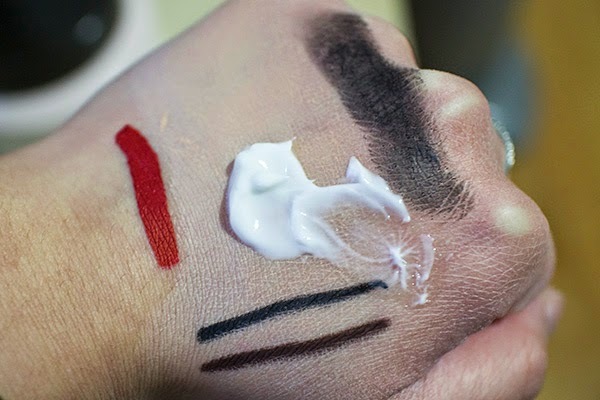 Excuse my poor dry hands, but here are some long-wearing makeup products that I've applied just to test the cleansing power of this cream. These are all products that last a good while, including the Kat Von D Liquid Lipsticks, the Covergirl 3 in 1 Foundation, the Maybelline Color Tattoos, and the Jordana Made to Last Eyeliners. 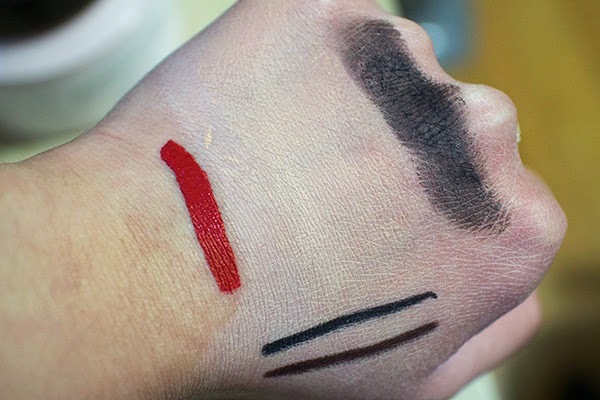 Depending on how much makeup you've used and how long-wearing they are, you'll need to massage your skin for longer. With these products, I had to massage my hand for about 30-45 seconds. On your face, it actually feels quite relaxing. 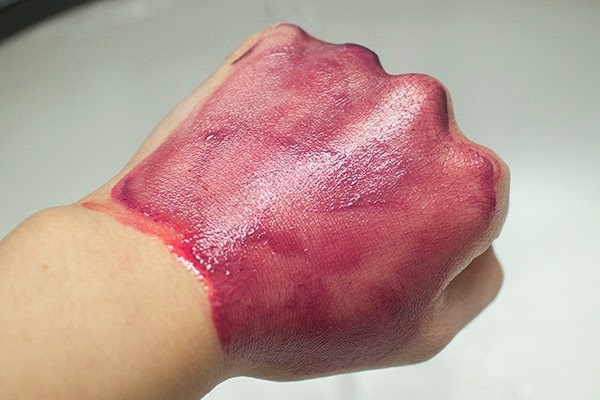 You'll see the makeup melt, and depending on how much pigment there is, you'll see it being picked up in the cream. My hand looks scary here because of the bright red lip colour haha! Fair warning, if you wear contacts, REMOVE them BEFORE you start using this. If you have sensitive eyes, just use this cleansing cream strictly for face makeup and use a separate eye makeup remover. However, I haven't had any issues with this getting into my eyes and it actually is effective at removing all kinds of makeup. Rinsing it off... You'll need to rub quite a bit to remove the cream. Keep rinsing until you feel like the slickness of the cream is gone. Dried and clean! 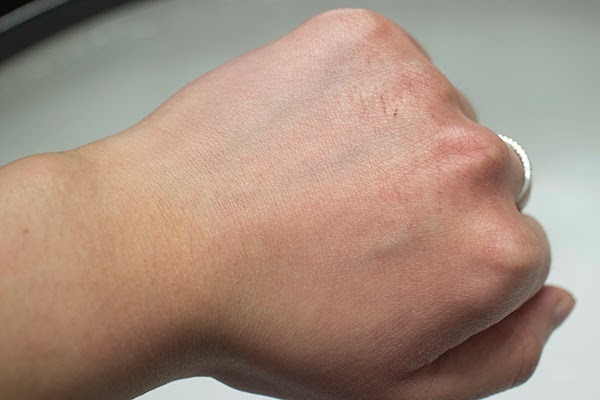 However, I want to point out how my hand is still slightly stained red. This is the point where you would follow up with a cleansing foam (or whatever your normal cleanser is) to remove the last trace of makeup! You're looking for a more moisturizing option to cleansing oils/balms for the winter. You're on a budget. $15 for 400 ml or $10 for 200 ml are good options since you don't need to use a lot every time. You're looking for a less wasteful (and more economical) option to facial wipes as the first step in makeup removal. Massaging your face relaxes you! There is nothing in the world that could possible prevent us for getting older. There is nothing that could halt the natural aging process from happening. Hi! My name is Kellie. I strive to produce the most honest and thorough reviews because I pride myself on my credibility as a consumer just like those of you reading. Please read on, and I hope you'll find something you'll enjoy! 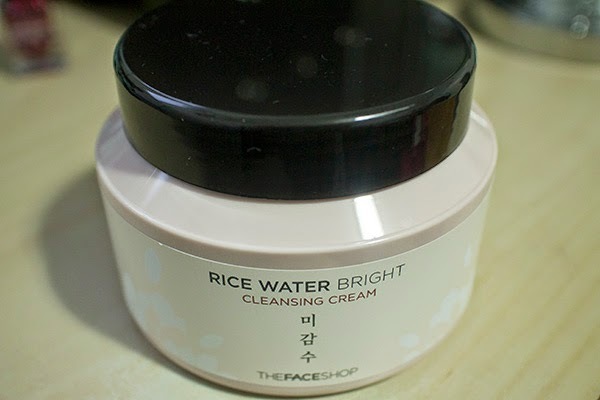 New Obsession: The Face Shop!